Learn more about our Language Services | Language Solutions Inc.
English rewriting into 6th and 4th reading levels for limited literacy readers, Health Literacy Awareness Workshops as well as focus group testing. Professional multilingual typesetting, including Asian, Arabic or RTL languages for those files that are in design formats. Working on an app that needs to be translated? Let us help you and your IT staff go through the steps to get apps localized. Need a video subtitled? Looking for voice-over talent? We take care of everything from translation to final production. We work directly with your web based files, your Content Management System or your WordPress site. Our proprietary linguistic screening process ensures that you can bring your product names and taglines in English out to other international markets with confidence. Melissa and the LSI team are stellar and their management skills are impeccable. Communication with Melissa is easy and she and her staff are responsive to the needs of a very complicated program being run by one of my firm’s biggest clients. We appreciate all of their hard work and their endless passion and can-do attitude! Client service is definitely LSI’s strong suit and the quality of their work exemplifies that. Thanks for all you’ve done! Technology used in our industry that benefits you. What does technology mean in our industry and how can you take advantage of technology that we employ in our every day work? Read about what you need to know on how translation content should be managed. Machine Translation or Automated Translation can be a great tool to get high volume content translation. Find out if Machine Translation is right for you and what you should consider. Translation Memory allows you to store your translations and English content in a database and create an asset for your organization. Let us manage those assets for you and save you costs, time and ensure consistency. Our Translation Management portal allows customers to submit projects, get information about status and also give client reviewers access to documents with the benefit of maintaining version control. Terminology is an important part of your brand. Terminology is also personal; it is part of the overall corporate identity. Find out how terminology management can work for you and not dilute your brand. When using a Content Management System, let us help you evaluate whether you can make use of translation management technology to get content automatically routed for translation. You create Digital Content for your Client. Now they want it in another language. Here's what you can expect when you Translate and Localize Digital. The majority of the survey platforms on the market offer you an internal option which enables you to be able to type the translation directly into the platform….which is great if your translators are in-house and their tools work in the platform. OR you can eliminate cut and paste on your end – as well as additional costs and time. You are now working in InDesign CC and need to share your fonts for typesetting of your assets and not sure if you can. Look to the Font’s Eula! You may not even be aware that your translated website is displaying characters incorrectly. Fonts may advertise as supporting certain languages…until someone figures out that 1 or 2 characters are corrupted. Organizations seeking a WordPress Translation Solution now can directly connect with Language Solutions for professional translation services. WPML is a downloadable plugin for WordPress that manages not only the translation workflow, but also can be configured to manage the translated languages displayed on your website. Maybe you don’t want the technology though and you want a workaround….we adapt. Expect in-depth knowledge on different file formats and how to work with them in translation Translating and localizing digital banners in dynamic HTML 5 combines various capabilities such as multilingual typesetting, CSS coding, XML processing, validation and browser testing. Expect certified localization project management that has the expertise to set up a project for translations from a client portal Out of context. Single strings in a file. May contain variable text. Need to decipher what exactly is to be translated. How do we manage this? Managed care and patient communications, pharmaceutical brochures, Medicaid/Medicare communications, medical devices and more. We specialize in Health Literacy in English and healthcare translations in other languages for this field. We love bringing LSI’s services to our clients, because it fits perfectly with the strategic, high-value approach they expect from Buck, and no global communication process is complete without addressing the critical issue of localization. LSI takes the foreign language content created for a short-term communication project and turns it into a long-term asset through the use of client-specific glossaries and Translation Memory. Creating value is what keeps our clients connected to us in the long term, they haven’t just spent money on a one-off communication campaign, they have now created a permanent asset for their organization. Localization Maturity is about matching your organization’s expectations on global communication outcomes with the right people, processes and technologies. As organizations grow and their localization (translation) needs grow, that organization will have to move through stages of maturity. 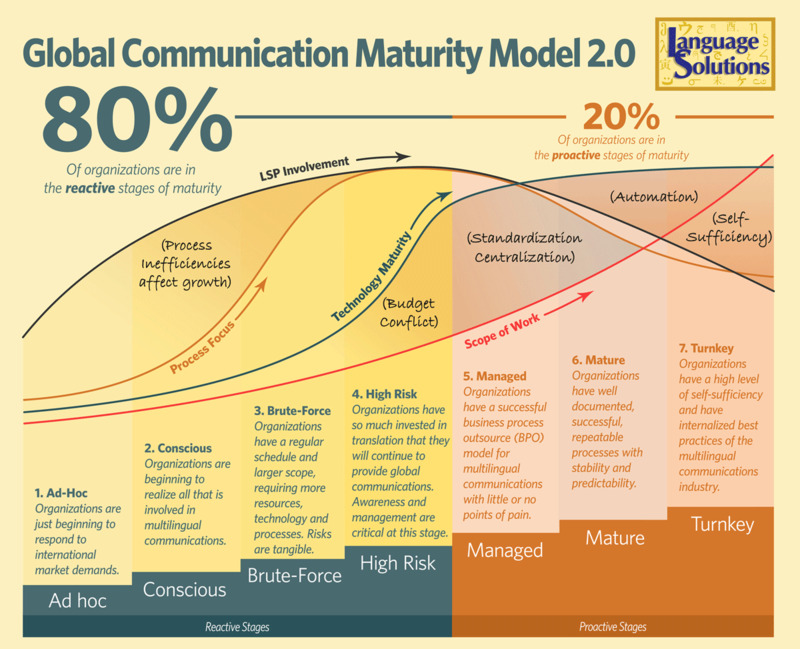 Our Global Communication Maturity Model™ 2.0 shows an enhanced view of the stages through which organizations will progress when implementing a global communications strategy. Each stage represents a point in time when an organization faces unique challenges that must be met and built upon in order to move forward on their global business path. Click on the Maturity Model image to enlarge. Then, scroll down for our Online Assessment to place your organization and get Actionable Information, learn about our Quality Process or the Tools to help you Succeed. Click on our model above for a full overview and then place your organization on the Maturation Model. We find that most of our clients can place themselves very easily by looking at the descriptions of each stage. You can also answer 5 questions in our online assessment below and we will estimate where you are on the map. This assessment will also highlight your risks at that particular stage and outline concrete ways that we can help you. For most common process issues, we already have meaningful metrics that we can use to evaluate progress. Together with the overall business objectives, we can begin to measure progress on process improvement and initiatives that can help you reach better cost efficiency and move you up the maturity model. Great partnerships are based on outcomes. We find the most effective collaborations should revolve around a common set of goals, objectives and preferred outcomes that we should expect from both parties. That is why we follow the Balanced Scorecard approach to define our relationship and to track progress. Continuous process improvement is an important part of this cycle. But it is important to work on SMART goals that are definite in time and can be controlled. Once progress has been made, it is important to control and document the process before moving forward. We can help to define the process that has resulted from the process improvement initiative and deploy this effectively to control the process.